Urbaser Ltd would like to sincerely apologise for the recent waste collection problems which residents in North Hertfordshire have been experiencing. We would like to reassure you that we are fully committed to working with the Council to ensure that the residents of North Hertfordshire receive the expected levels of service. Residents may be aware that at the start of our new contract in May 2018, we experienced problems with the data for those people who had subscribed to the brown bin garden waste service. 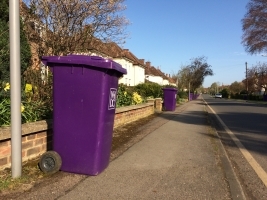 These initial data issues have since been resolved, however there have also been problems with new rounds for brown bin and food waste in particular, where crews are getting used to the new rounds and new collections systems. We have also been experiencing some employment related issues which we are addressing, but we acknowledge these have contributed to the current problems. Finally, we know that the level of service has not been up to the standard that residents expect and we are doing our utmost to come up with solutions so that normal service can be resumed as soon as possible. Thank you for your continued patience and for bearing with us.